For our discussion, I’ll define mindfulness as the art of controlling your thoughts, and remaining aware that you are in control of your thoughts. Mindfulness can involve keeping your mind in the present moment, not thinking about the past or the future. Mindfulness could be taking control of those “I can’t” thoughts and turning them into “I will” thoughts. It can be the difference between making your goal, or getting so lost in your own head or doubts that you miss it. You may have heard the phrase “run the mile you’re in.” Mindfulness has a similar goal, but for the mental part of the run, your yoga practice, or any aspect of your life. Simply put, mindfulness is the reminder that you are in control of your thoughts and your body. It’s the conscious choice not to ruminate or suffer mentally, but to let go of the things that don’t matter and to stay in the present moment, mentally. It’s easy to let our minds wander as we run. We dissociate with what we’re feeling and let our minds and feelings take us where they want to go. That dissociation can be helpful at times. If your legs are really tired or sore or you really feel the burn in your muscles, thinking about something else helps distract you from the discomfort of your training. But when you let your mind wander, you get yourself used to letting your mind go wherever it wants to go. Then, when it really counts, you don’t pay attention to what you’re thinking. Suddenly, you’re thinking to yourself, “I don’t think I can keep this up for much longer.” Or, “I’m not strong enough to do this.” You start to doubt your training, your abilities, or yourself. That lack of focus can make or break a race, or even a training run. Those negative thoughts are the difference between making your goals and falling short. 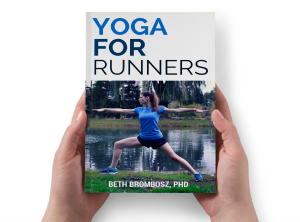 What mindfulness and yoga can teach runners is to concentrate on the body’s sensations that we can control, primarily breath and running form. 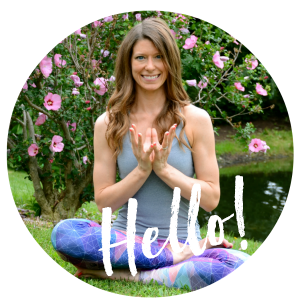 Mindfulness is not about concentrating on how much your legs hurt, it’s about letting go of discomfort and letting go of any emotional ties with that discomfort. In yoga class, we do this intentionally. You practice your mental control so you can practice letting go and be at peace with that discomfort. Here’s an example: in yoga class, you’re in a lunge position and your quads are starting to fatigue and burn. Your mind naturally starts to focus and stew on that discomfort. You start to wonder when your teacher is going to let you out of that lunge. You wonder how long you can stay in before giving up. (Sound familiar? “How much longer is this race?” “I might have to quit at Mile 10.”) Maybe you even start to get a lump in your throat because you’re feeling frustrated that you’re expected to stay in the pose, or that you can’t hold it as long as you want. Then, your yoga teacher reminds you to you learn to breathe through your discomfort. She reminds you to let go of your thoughts and focus on your breath. You sigh out the discomfort you’re feeling. With every exhale, you let go of that frustration and emotion. Suddenly, you’re back in control, and you can stay in that lunge a lot longer than you thought you could. Those are the lessons you’ll take with you to your tempo run, long run, or race. That mental control is what’s going to make you a stronger runner. That mindfulness you learn on your mat is going to help you crush your running goals. So how can you use mindfulness to get you through a tough run? Instead of focusing on how tired your legs are or how many miles you still have to run, focus on the things you can control at that moment. Think about taking nice deep breaths, keeping proper running form, or maybe even about improving your running cadence. Concentrate on the things that you can change in your body in that moment instead of thinking about how you feel about the run emotionally. Practicing mindfulness will help you get through those tough runs and make them feel just a little bit easier. Runners: any tips for staying mindful during tough runs? When have you practiced mindfulness? How has mindfulness helped you in other aspects of your life? I also try to pay attention to my breathing when I run. If I am breathing too hard, I try and low down. So many times at the beginning of long races, runners breathing very hard will pass me or be running alongside me. 9 out of 10 of them are wearing headphones so they can’t hear themselves breathe. I want to tap them on the shoulder and tell them to slow down and relax, but I let them go and run their own race. Anyway, as you mentioned, I try also to see how my form is at certain stages. If my legs are swinging a little too much left to right (i.e. I am occasionally scraping my calf/ankles with my other foot), I need to slow down and relax. This is such great advice. I have noticed, maybe because I’m older, maybe because I don’t train as seriously anymore, that I frequently just let my mind wander when I run. Like you said, that’s not a totally bad thing. In fact, I’ve written some great blog and Instagram posts on the run (not to mention the many Letters to the Editor that never get sent about things that I want to complain about. 🙂 ). But being mindful when you are running is really important most of the time, especially during active training. Great ideas for helping to get my mind in the game. I’ve definitely implemented mindfulness on the run, taught to me by my yoga training. I am so thankful to have that in my back pocket.